Sometimes your gentle comics hit me just right, like today. 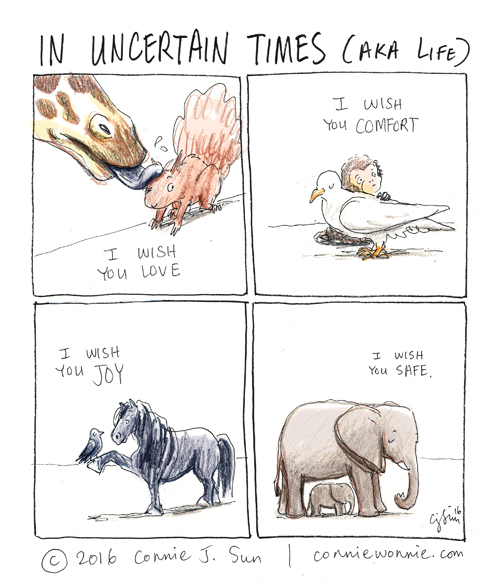 "In uncertain times" is beautifully rendered. Thank you, Connie, for sharing your talent with us. You don't know me and yet so often you speak directly to my heart and situation. I wish I could give you some back. All I can do is comment, so I do. Are you going to be selling this one as a print? Because I have so many people I'd love to buy it for!